TransGraph Consulting Pvt. Ltd. was founded by Mr. Nagaraj Meda in 2003 with a strong belief and passion to provide price forecasting and risk management solutions to various companies in manufacturing, trading, refining and FMCG industry segments. TransGraph is focused in providing services to players who deal with commodities physically and having exposure to derivatives as part of its hedging activities. 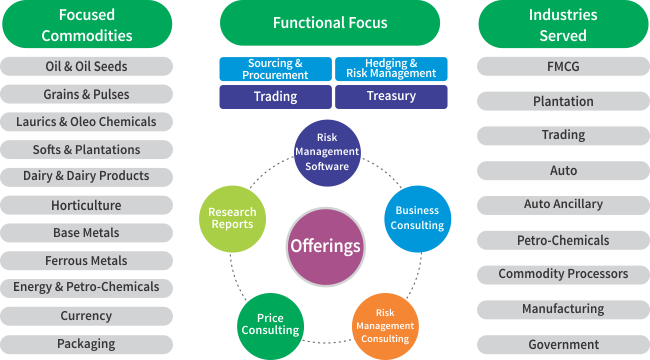 TransGraph's deliverables span from research reports, hedge modeling, drafting of risk management policy, customized procurement / trading / hedging strategies with support from focused and knowledgeable engagement managers to powerful risk management software - TransRisk. TransGraph has 100+ active client base spanning across 28+ countries encompassing Auto & Auto Ancillary, FMCG, Trading, Metals, Mining & Petro-chemical industries. TransGraph's researchers and consultants are well respected in the market and a team of 100 people with 70+ post Graduates (Masters) in finance, economics, trading, risk management, statistics, agri-business, dairy, agriculture, marketing, business management are well trained to provide knowledge based decision enabling solutions to commodities industry. TransGraph's services basket enables the customers to put in place a proper system / process of 'what to do' (what price to buy/sell, which instrument to use for hedging, which hedge model, process and team structure to follow) and 'what not do' (what kind of limits, alerts, control process to follow). To be the world leader in providing knowledge empowered decision enabling solutions to the commodity eco system. - Create simple, useful and comprehensive solutions with unique combination of research, consulting and Technology. - Establish a brand that is recalled for the benchmark industry practices, trusted delivery, innovative solutions and best return on investment. - Create an organization that will be known for its values in terms of professionalism, transparency, honesty and integrity. TransGraph's reports are widely read, consulting services & software product are availed by leading corporates. Below map depicts the world wide reach of TransGraph. is a Latin noun or prefix, meaning 'beyond'. is a representation connected by links. So, Intrinsic meaning behind our Brand Name is "WORKING BEYOND BOUNDARIES"